Accounting is one of those subjects that everyone seems to have an opinion about. Some claim that it's boring number-crunching that attempts to justify shady business decisions. But the truth of the matter is, without skilled accountants, it would be impossible for a business to keep tabs on its performance. Accountants tell the leaders of a business whether or not they have sufficient funds to invest in a new program, explore potential growth opportunities, or go on a leadership retreat to Tahiti. Text books in accounting range from basic introductions to the fundamentals of the business to complex explanations of accounting principles that would make most peoples' heads spin. Renting accounting textbooks is a great accounting principle too, because it saves money over buying a book that you may not need after this semester's class. 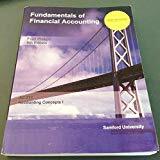 When you rent textbooks, in accounting or any other subject, you're showing sound financial judgment, which is an impressive trait for a future accountant. Textbook rental is fast, safe, and easy, and you're not stuck afterwards with a textbook the bookstore won't buy back from you. When you rent accounting textbooks, you don't need double-entry bookkeeping to know it's a wise decision. Not looking for Accounting textbooks? You can rent algebra textbooks or browse through some of our other textbook rental categories.